Gingival ulcer is often accompanied by severe pain and bleeding and prevents the practicing of appropriate oral hygiene. Most inflammatory and immune-mediated gingival ulcers can be successfully treated with topical corticosteroids, but those refractory to corticosteroids are difficult to treat. An 18-year-old female visited our clinic with a complaint of gingival bleeding. Since topical corticosteroids and oral antibiotic were not effective for gingival ulcers of the patient, an anti-gastric ulcer agent, irsogladine maleate, was used. Oral administration of irsogladine maleate reduced gingival bleeding. The patient became able to perform tooth brushing, and the bleeding from the gingivae was markedly improved. Oral administration of irsogladine maleate may be useful to improve persistent bleeding from gingival ulcers caused by inflammatory and immune-mediated gingival disease with minimal adverse effects. Gingivitis is classified as a dental biofilm-induced or non-dental biofilm-induced gingival disease, according to the international classification of periodontal and peri-implant disease and conditions determined in the 2017 World Workshop . The latter includes genetic/developmental, specific infections, inflammatory and immune-mediated, reactive processes, neoplasms, endocrine, nutritional and metabolic diseases, traumatic lesions, and gingival pigmentation. Persistent gingival bleeding occurs when the gingival mucosa becomes fragile due to an inflammatory and immune-mediated gingival disease and forms ulcers by a frictional procedure such as brushing [2-5]. Under these circumstances, it is difficult to maintain oral hygiene, and so secondary dental biofilm-induced gingival diseases will be also induced. Most inflammatory and immune-mediated gingival diseases can be successfully treated with topical corticosteroids [3-5]. Antibiotics are effective for dental biofilm-induced gingival diseases . However, there are cases that are refractory to these treatments and difficult to treat. Irsogladine maleate is a drug for peptic ulcer and gastritis. It has been shown to promote gap-junction-mediated intracellular communication through an increase in cAMP production via the inhibition of phosphodiesterase [7,8] and improve aphthous stomatitis and non-steroidal anti-inflammatory drug (NSAID)-induced gastric and small-intestinal injuries [8-11]. We report an adolescent case in which persistent bleeding from gingival ulcers was successfully treated with irsogladine maleate. An 18-year-old female patient visited our clinic with a complaint of gingival bleeding that had persisted for more than 2 months. She had no reported medical and dental problems. There was no remarkable family medical history. Before visiting our hospital, the patient had been treated with topical corticosteroid and oral antibiotics, but improvement was not observed. Physical examination revealed fiery red, glazed, atrophic, or eroded-looking gingivae and ulcer formation at the interdental papillae. Bleeding from the gingivae was easily induced by contact with a cotton swab, and the epithelium was easily peeled off, resulting in bleeding from the ulcer surface (Figure 1). Due to the pain caused by tooth brushing, she could not maintain adequate oral hygiene, and the deposition of dental plaque and calculus formation were observed on the labio-buccal side of the upper and lower teeth. Because of bleeding by probing, full mouth periodontal condition was not evaluated. No particular bulla lesions and no white linear or reticular lesions in other areas of the oral mucosa were observed. The diagnosis was inflammatory and immune-mediated gingival disease. There were no ocular, pharyngeal, or skin lesions. 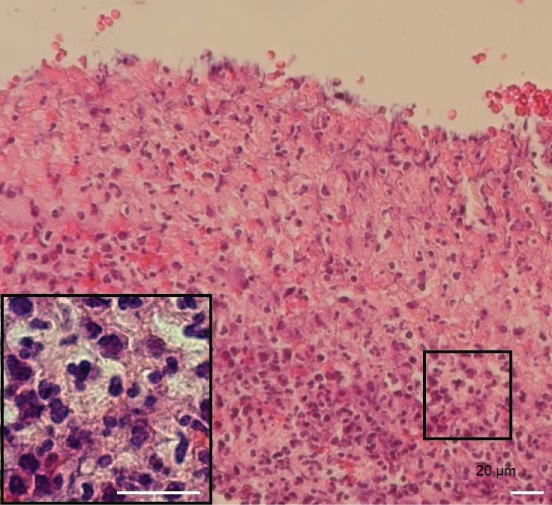 Histologically, there was no epithelial layer or ulcerative tissues with subepithelial inflammatory infiltrates containing plasma cells (Figure 2). Results of blood examination were within normal range: WBC, 6,000/µL; RBC, 511 × 104/µL; hemoglobin, 14.2 g/dL; platelet, 25.1 × 104/µL; prothrombin time-international normalized ratio (PT-INR), 0.99; activated partial thromboplastin time (APTT), 28.8 sec; C-reactive protein (CRP), 0.06 mg/dL; desmoglein 1, < 5; desmoglein 3, < 5; BP-180, 5.7; rheumatoid factor, 5 IU/mL; antinuclear antibody, < 40. Commonly existing oral bacteria, Streptococcus and Neisseria, were isolated from the surface of the ulcers. Treatment with topical corticosteroid was initiated, but the patient discontinued the treatment after a week because of irritant pain and bleeding. We decided to use irsogladine maleate at an initial dose of 8 mg per day. One month later, her gingivae were still hemorrhagic, but she reported decreased bleeding on mouth washing. Three months later, bleeding had further improved (Figure 3). She could perform brushing actively and the dose of the drug was decreased to 4 mg per day. Four months later, dental plaque and calculus deposits were removed, and she could maintain appropriate oral hygiene by herself. The medication was discontinued 6 months later, but recurrence was not observed for at least 3 months. 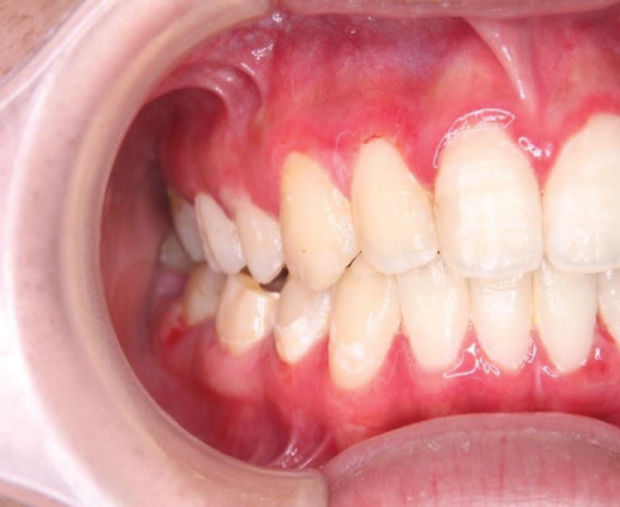 According to a recent classification, gingivitis of this young patient was considered to be an inflammatory and immune-mediated gingival disease . The epithelium of the specimen was peeled off during manipulation for biopsy, suggesting that the adhesion of the epithelium was very weak. Furthermore, the symptoms of the patient are similar to those of clinical diagnosis, desquamative gingivitis, caused by immune-mediated mucocutaneous conditions, particularly oral lichen planus, mucous membrane pemphigoid, and pemphigus vulgaris. Other causes include allergic reactions to toothpastes/mouth rinses, Crohn’s disease, psoriasis, linear IgA disease, and chronic ulcerative stomatitis . Histologically, the subepithelial band-like infiltration of lymphocytes, a specific feature of oral lichen planus, was not observed in the present case. There were no bullae or blisters on the oral mucosa, and antibodies to desmoglein 1 and desmoglein 3 were negative, meaning that oral lichen planus and pemphigus vulgaris could be excluded as the cause of gingivitis . In mucous membrane pemphigoid, a variety of molecules located in the basement membrane zone, such as BP-180, laminin 5, laminin 6, α6-β4 integrin, and collagen VII, can be the target of this autoimmune disease [12,13]. In the present case, we identified plasma cell infiltration in the ulcers of the specimen, suggesting the presence of antibody-producing cells in the subepithelial zone, though an antibody against BP-180 was undetectable. Together, an immune-mediated mucous membranous disease such as mucus membrane pemphigoid may be involved in gingival bleeding as a background disease. The patient was young and otherwise healthy, and only commonly existing oral bacteria were detectable from the ulcer surface. Drug-induced gingivitis and necrotizing ulcerative gingivitis could be excluded . The treatment of gingivitis is dependent on the diagnosed cause of the disease. The most common therapy for autoimmune mucosal diseases is topical corticosteroid. Indeed, our case had received this prior to visiting our clinic with no clinical effect. Her ulcers were formed in interdental papillae in the molar tooth region, and bleeding occurred from the erythematous gingivae. If other mucosal sites or the skin is involved, then more potent medication such as the systemic corticosteroids, azathioprine, sulphapyridine, or diaphenylsulfone (dapsone) is used [3,4]. However, less harmless drugs were considered to be better in this localized case to avoid long-standing adverse effects. Irsogladine maleate protects the mucosa based on a mechanism suggested to be different from those of antisecretory drugs and was reported to be very efficient for ulcer lesions such as aphthous stomatitis, NSAID-induced gastritis, and stomatitis caused by anticancer drugs [10,15]. Serious adverse effects were not reported . In agreement with previous findings in other ulcerative diseases, we found that irsogladine maleate was effective for bleeding from gingival ulcers. The patient felt that the level of bleeding had improved after treatment for one month. Thereafter, she was able to clean her gingivae and the dental plaque decreased, which contributed to the marked improvement of her condition. In gastric mucosa, irsogladine maleate has been shown to increase intracellular cAMP content via non-selective inhibition of phosphodiesterase isozymes, which is likely to be an important mechanism involved in its gastroprotective actions . In human nasal epithelial cells, it has also been reported that irsogladine maleate induces gap junctional intercellular communication (GJIC) activity and maintains the GJIC-dependent tight junctional barrier . Tumor necrosis factor-alpha (TNF-α) is a major inflammatory cytokine produced in response to oral bacteria . The addition of TNF-α to cultures of gingival epithelial cells increased cell permeability as well as human airway epithelial, intestinal epithelial, and corneal epithelial cells . Irsogladine maleate has been shown to regulate gingival permeability by preventing the TNF-α-induced disruption of E-cadherin and claudin-1, a tight junction structure protein. This can be suppressive for ulcer formation in the oral mucosa. TNF-α also induced loss of barrier integrity in the endothelium . Irsogladine maleate may improve gingival bleeding by reducing the permeability of blood vessels. Persistent bleeding and ulcer formation prevent the cleaning of affected gingivae and teeth and a secondary dental biofilm-induced gingival disease will occur. After improvement of gingival bleeding by irsogladine maleate, the patient could perform brushing actively. This must further promote the healing of her gingivitis. There are gingival diseases that induce gingival ulcers and bleeding and are resistant to corticosteroids and antibiotics. 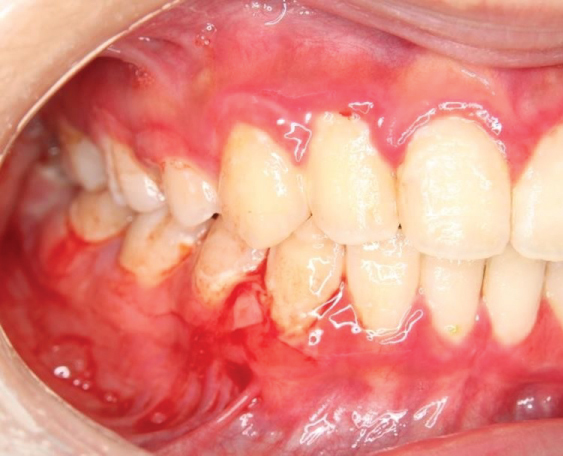 This is the first case that highlights the effectiveness of irsogladine maleate on persistent bleeding from gingival ulcers caused by inflammatory and immune-mediated gingival diseases in an adolescent patient. G Caton J, Armitage G, Berglundh T, Chapple ILC, Jepsen S, et al. 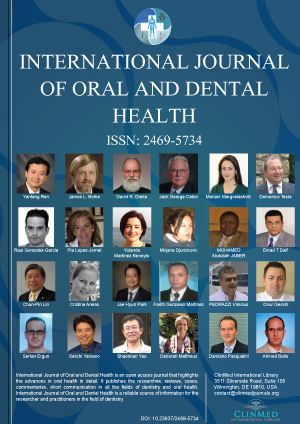 (2018) A new classification scheme for periodontal and peri-implant diseases and conditions-introduction and key changes from the 1999 classification. J Clin Periodontol 20: S1-S8. Robinson NA, Wray D (2003) Desquamative gingivitis: A sign of mucocutaneous disorders-a review. Aust Dent J 48: 206-211. Lourenço SV, Boggio P, Agner Machado Martins LE, Santi CG, Aoki V, et al. (2006) Childhood oral mucous membrane pemphigoid presenting as desquamative gingivitis in a 4-year-old girl. Acta Derm Venereol 86: 351-354. Lo Russo L, Fedele S, Guiglia R, Ciavarella D, Lo Muzio L, et al. (2008) Diagnostic pathways and clinical significance of desquamative gingivitis. J Periodontol 79: 4-24. Yepes JF, White D (2012) A young patient with persistent gingival bleeding. JAMA 307: 2430-2431. Dar-Odeh N, Fadel HT, Abu-Hammad S, Abdeljawad R, Abu-Hammad OA (2018) Antibiotic prescribing for oro-facial infections in the paediatric outpatient: A review. Antibiotics (Basel) 7: 38. Ueda F, Ban K, Ishima T (1995) Irsogladine activates gap-junctional intercellular communication through M1 muscarinic acetylcholine receptor. J Pharmacol Exp Ther 274: 815-819. Akagi M, Amagase K, Murakami T, Takeuchi K (2013) Irsogladine: Overview of the mechanisms of mucosal protective and healing-promoting actions in the gastrointestinal tract. Curr Pharm Des 19: 106-114. Hara A, Murata T, Uemura R, Miura T, Fukui K, et al. (1999) Identification of connexins in human oral mucosa and therapeutic effect of irsogladine maleate on aphthous stomatitis. J Gastroenterol 34: 1-6. Nanke Y, Kamatani N, Okamoto T, Ogiuchi H, Kotake S (2008) Irsogladine is effective for recurrent oral ulcers in patients with behçet's disease: An open-label, single-centre study. Drugs R D 9: 455-459. Isomura Y, Yamaji Y, Yamada A, Watanabe Y, Suzuki H, et al. (2014) Irsogladine improves small-intestinal injuries in regular users of nonsteroidal anti-inflammatory drugs. Gastrointest Endosc 80: 118-125. Fleming TE, Korman NJ (2000) Cicatricial pemphigoid. J Am Acad Dermatol 43: 571-591. Chan LS, Ahmed AR, Anhalt GJ, Bernauer W, Cooper KD, et al. (2002) The first international consensus on mucous membrane pemphigoid: Definition, diagnostic criteria, pathogenic factors, medical treatment, and prognostic indicators. Arch Dermatol 138: 370-379. Hasan S (2014) Desquamative gingivitis-a clinical sign in mucous membrane pemphigoid: Report of a case and review of literature. J Pharm Bioallied Sci 6: 122-126. Nomura M, Kamata M, Kojima H, Hayashi K, Sawada S (2013) Irsogladine maleate reduces the incidence of fluorouracil-based chemotherapy-induced oral mucositis. Ann Oncol 24: 1062-1066. Kyoi T, Oka M, Noda K, Ukai Y (2004) Phosphodiesterase inhibition by a gastroprotective agent irsogladine: Preferential blockade of cAMP hydrolysis. Life Sci 75: 1833-1842. Miyata R, Nomura K, Kakuki T, Takano K, Kohno T, et al. (2015) Irsogladine maleate regulates gap junctional intercellular communication-dependent epithelial barrier in human nasal epithelial cells. J Membr Biol 248: 327-336. Kesavalu L, Chandrasekar B, Ebersole JL (2002) In vivo induction of proinflammatory cytokines in mouse tissue by porphyromonas gingivalis and actinobacillus actinomycetemcomitans. Oral Microbiol Immunol 17: 177-180. Fujita T, Yumoto H, Shiba H, Ouhara K, Miyagawa T, et al. (2012) Irsogladine maleate regulates epithelial barrier function in tumor necrosis factor-α-stimulated human gingival epithelial cells. J Periodontal Res 47: 55-61. Shivanna M, Srinivas SP (2009) Microtubule stabilization opposes the (TNF-alpha)-induced loss in the barrier integrity of corneal endothelium. Exp Eye Res 89: 950-959. Yoshiaki Yura, Department of Oral and Maxillofacial Surgery, Osaka University Graduate School of Dentistry, 1-8 Yamadaoka, Suita, 565-0871, Japan. © 2018 Masui A. This is an open-access article distributed under the terms of the Creative Commons Attribution License, which permits unrestricted use, distribution, and reproduction in any medium, provided the original author and source are credited.